Not at all. Oil has no impact on fuel dilution. Some oils may handle the fuel better, but that couldn't be discerned from a UOA. At least that I'm aware of. What type of driving? City, suburban, mostly highway etc? Mostly suburban. One or two long highway trips to the in-laws each month which are each roughly 180 miles round trip. Work commute is 10.5 miles each way, 3-4 days a week. We're driving about 100-120 miles a week. According to some long time members over at BITOG, Blackstone has a inefficient way to measure fuel dilution. Another lab called Polaris used gas chromatography which gives a more accurate reading. I believe NAPA auto parts uses them for their oil analysis service. If you are worried about fuel dilution one sure way to help keep it lower is for more frequent oil changes. It looks like you are running 10k oci. I might suggest 7.5k and see how that works. Another is to use a major brand of synthetic oil that is dexos1 Gen2 licensed and or SN Plus which is the newest API standard. Using different oil could make difference on fuel dilution in oil. My wife's CX-5 is seeing lots of short trips, and indeed the oil level goes up. Used oil analysis shows fuel dilution, as expected. ⋯ I changed the oil and filter on December 31 (only filled the oil to halfway between add and full) I checked it last night and is already a little over the full mark on the dipstick. What kind of oil do you use? High calcium content oil promotes LSPI. Additive effects on the frequency of LSPI in the Ford test. The "High Ca" oil has a calcium concentration typical of those in the market today. The “Low Ca” has been reformulated to resist LSPI, and is representative of how many next generation oils will behave. The oil itself cannot affect fuel dilution unless you go to a heavier grade like a 40wt and even then that is iffy. Fuel dilution happens regardless of the oil. What the oil can do is to help prevent LSPI. The primary components affected are calcium and sodium. These are lowered or eliminated in the newer d1G2 oils. Magnesium is increased for cleaning along with boron in some cases. Valvoline has used a sodium based oil for their Synpower for some time now. Synpower is no longer and their new synthetics Advanced and Modern Engine along with Maxlife Full Syn now have a robust moly, titanium, and boron add pack. That’s a good example of how oils have changed to the new specs. All oils are now following these new specs except for Shell/Pennzoil which is late to the game but should be on board soon. I put in Castrol Edge on my last change. It was on sale for $19 for 5 qts. I plan to get an oil analysis done on my next change. I didn't want to do it before because you never know exactly what oil the dealer uses. Bingo. Fuel dilution is a reality on all engines, there will always be some fuel that gets into the oil. DI engines are significantly more prone to fuel dilution, this is the nature of the beast. LSPI, as you mentioned, is something else entirely and that is proving to be partially handled by changing in oil chemistry. The reason I'm using SynPower is because I already had it in my oil stash. I've got one more 5 qt jug then I'll start using Idemitsu 0w20 which I have 40+ quarts of. Thank you Advance Auto and your clearance of Idemitsu . ⋯ The reason I'm using SynPower is because I already had it in my oil stash. I've got one more 5 qt jug then I'll start using Idemitsu 0w20 which I have 40+ quarts of. Thank you Advance Auto and your clearance of Idemitsu . Then what are you going to do when you use up those 40+ bottles of Idemitsu oil? May be you can switch to Mazda moly oil made also by Idemitsu? So...I should be worried about my Made in Mexico Mazda filter??? Then what are you going to do when you use up those 40+ bottles of Idemitsu oil? I believe you've seen my post in another thread with links showing thosd 3 Mazda OEM oil filters been cut open and checked after several thousand miles of service and made in Mexico Mazda filter looked as good as the other 2. But once I ran out my made in Japan OEM filter I'd choose made in Thailand filter instead of Mexican one simply because it comes with better packaging: greased O-ring type gasket、shrink-wrapped seal on baseplate preventing dust、and packaged in a non-sealed paper box. But my current oil filter cap wrench may become useless because Thai filer is a little smaller in overall diameter. PE01-14-302A Made in Japan with the best quality. and packaged in a sealed paper box. Smaller in outside diameter than PE01-14-302A. and packaged in a non-sealed paper box. Based on picture provided by madar, Mazda OEM value-line PE01-14-302A-MV oil filter does look different from Wix 57002. But I'd still get PE01-14-302A-MV OEM "value" filter if there's no other OEM choices! 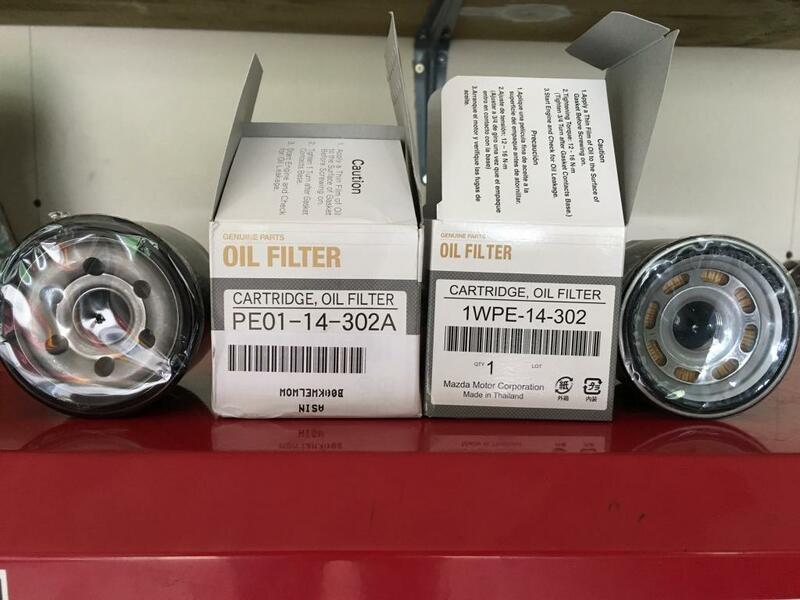 I saw some people complained that they ordered PE01-14-302A online, but received 1WPE-14-302 Mazda oil filter instead! (boom05) The seller explained that Mazda officially superseded PE01-14-302A with 1WPE-14-302 and nothing he could do about it. Of course the seller insisted the quality between the two is the same because they both are OEM. When I placed the order to Med Center, I called them first making sure they'd send me PE01 filter when they saw my particular order. Thailand made 1WPE filter has smaller diameter than Japan made PE01 filter and my current oil filter cap wrench would fit smaller 1WPE filter a little loose. Wix 57002 filter is specially made for Mazda SkyActiv engine. I just did an oil change on my 2017 with 1,500 miles. I went with the Mobil 1 Extended Performance oil fitler & Mazda Moly 0w-20 in quart bottles. Oil filter with good quality doesn’t mean it meets Mazda’s unique high-flow specification for SkyActiv-G engines. According to Mobil 1™ website, M1-108A oil filter is compatible with many other filters including both Mazda OEM B6Y1-14-302A and PE01-14-302A filters unfortunately Mazda USA has said conventional B6Y1-14-302A filter can’t be used on SkyActiv-G’s due to different specs. A single filter definitely can’t meet the requirements of 2 filters with different specs. 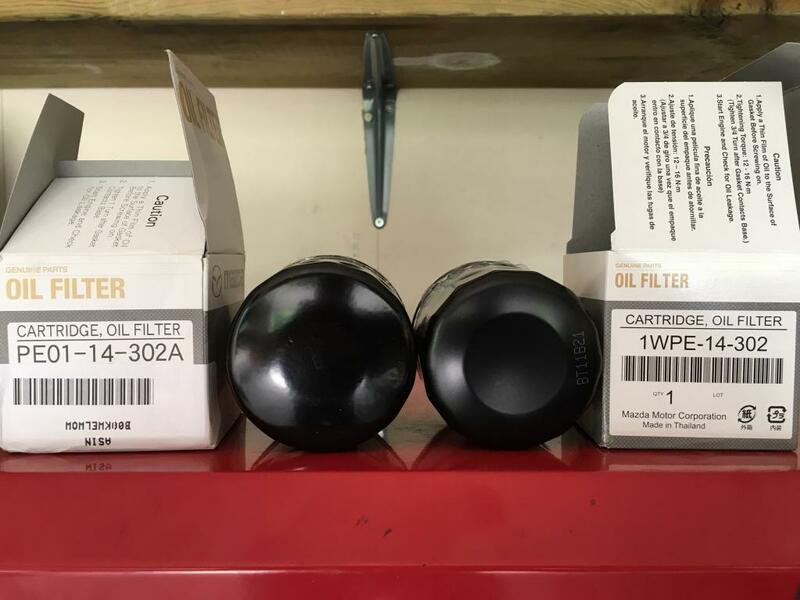 Here is one MNAO PDF to their US Mazda Dealers concerning genuine Oil Filter(s) installation and use for ALL SA Engines..
Mazda Dealers (in USA particularly) are also seeing stored DTC's (Diagnostic Trouble Codes in PCM) when they use even 'other' genuine Mazda oil filters in Skyactiv engines, see pic, they look identical, but it is what is inside. I just picked up the same M1 108A and will use it along with Valvoline’s updated Advanced Synthetic 0w-20. It’s a good filter and can be used with no worries.